Evaluation is a key tool to find out the concerns and issues that are important to a community to decide on the appropriate actions to take and then to measure the effectiveness of the actions on an ongoing basis. There are many different kinds of evaluation. We aimed to make our evaluation as participatory as would could. There are many resources and toolkits about participatory evaluation. Some of them are linked to at the end of this section. The Green Zone project has faced a lot of challenges, but the key one has been how to evaluate the impact of our very short-term project. The amount of time we have been able to allocate to evaluation has been relatively short but we tried our best to make it an important part of what we achieved. The Green Zone carried out a baseline survey which helped us gauge the starting point of the community, their skills and their concerns. It was a big piece of work and the scale of the survey did put some people off completing it. It contained a lot of qualitative questions about how people felt. We did get very useful feedback from it and can use it to compare the attitudes and aspirations of the community at the beginning and end of the project. We used community and planning events as ways for the community to evaluate the work that had happened on the estate so far. The maps were ways of expressing feelings of what had worked and what had not. The mapping events also encouraged people to dream and visualise changes that they would like to see. Our website and community email list are both very immediate and inexpensive ways of undertaking participatory evaluation and disseminating the results. We worked hard to build up the website as a community resource and to help raise awareness of the email list. The email discussion list was also a medium for the kind of information about how people feel that would never be included in evaluation forms. We created two evaluation forms for the end of the project. One was short and consisted of two sides of an A4 sheet, which was delivered through all of the doors on the estate. It was also available as an online form. The evaluation form was more in depth and could be completed online. Sites such as survey monkey are free and can produce reports. To avoid relying on purely written forms of evaluation we also wanted use audio equipment to record some more in depth evaluations. 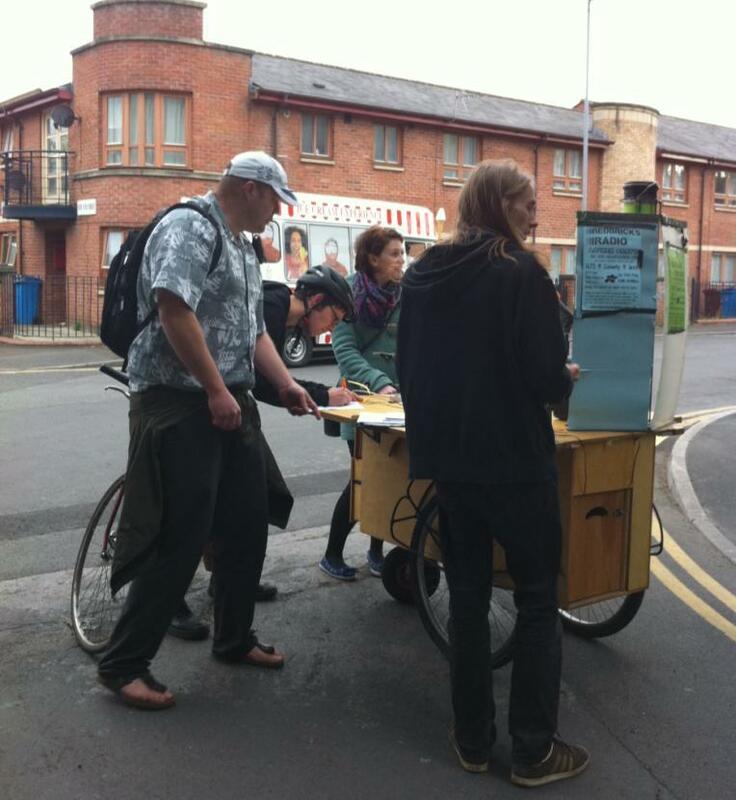 We borrowed a trolley that local group Ordsall Commmunity Arts use for creative evaluations and took to the streets. We also used this as an opportunity to promote the Redbricks Radio project.